Xylem volunteers partnered with Keep Brazos Beautiful (KBB) to participate in the annual Texas Trash-Off, an event in which the community gets together to clean up local parks and creeks. 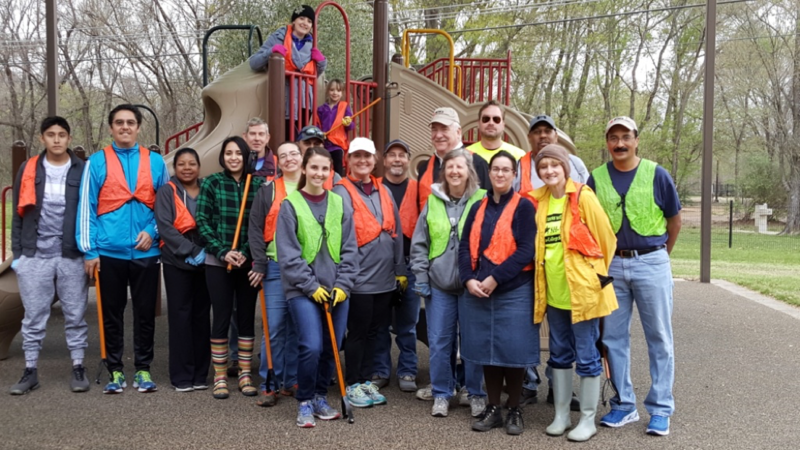 Twenty Xylem employees partnered with Keep Brazos Beautiful (KBB), an organization in Bryan, TX that works to educate and engage Brazos County citizens on the importance of keeping the community clean, green, and beautiful. KBB hosted the "Texas Trash-Off," providing volunteers with an opportunity to clean up trash near local creeks in College Station, TX. These creeks flow into the Navasota River, which feeds into the Gulf of Mexico. By participating in this event, Xylem volunteers learned about the importance of keeping local communities clean and water resources less contaminated.